Can I give my ferret raw eggs? | Can i Give My Ferret? Can you give your ferret raw eggs? A healthy diet is the best way to keep your pet ferret healthy, happy and full of energy. A ferret’s digestive system is suited to a diet of high levels of protein and fats. They are carnivorous animals and struggle to digest food high in fiber, such as fruits and vegetables. Eggs have a high protein content so are great for your fuzzy friend to eat. Can you give your ferret raw eggs? Raw eggs are safe for your pet ferret, however 1 or 2 a week is enough as too many eggs has been known to cause constipation in ferrets. Raw egg whites contain an enzyme called avidin, which is a biotin binding protein and anti-nutrient. In small doses however this is not a problem, raw egg whites contain only 0.05% avidin and the raw egg yolks have one of the highest concentrations of biotin found in nature. Cooking the eggs destroys the avidin, which will help release more biotin from the egg. If you feed your ferret more than 2 eggs a week, then it is best to remove the egg whites first and give only the yolks or cook the eggs. The egg yolk is high in nutrient value containing calcium, iron, phosphorus, zinc, thiamine, folate, vitamin B6 and vitamin B12, vitamins A, D, E and K as well as carotenoids, lutein and zeaxanthin. A single egg can contain 77 calories, 6 grams of protein and 5 grams of healthy fats, so this is an ideal food in your ferret’s diet. The only problem you might meet is getting your ferret to eat the eggs. 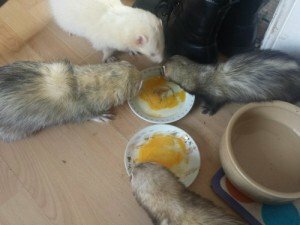 Not only can raw eggs be messy to eat, some ferrets will reject them entirely. Ferrets are fussy eaters and set in their ways when it comes to meal times. If they don’t like the eggs raw, then try boiling or frying them, you could also mix a raw egg in with their other food. If the eggs are boiled you can give it all to your ferret including the shell, they will enjoy playing with the egg first before breaking open the shell and finding a tasty surprise inside. Along with a healthy diet, it is also important to give your ferret plenty of exercise, fresh water, fresh air and plenty of love. A happy ferret will give you and your family many years of companionship and fun.